Every so often you come across the interior design of a home that makes you stop to take a closer look. Because though at first glance it appears to be quite simple, rather like unpeeling an onion, you discover there are several layers to the design. And it is utterly inspiring. 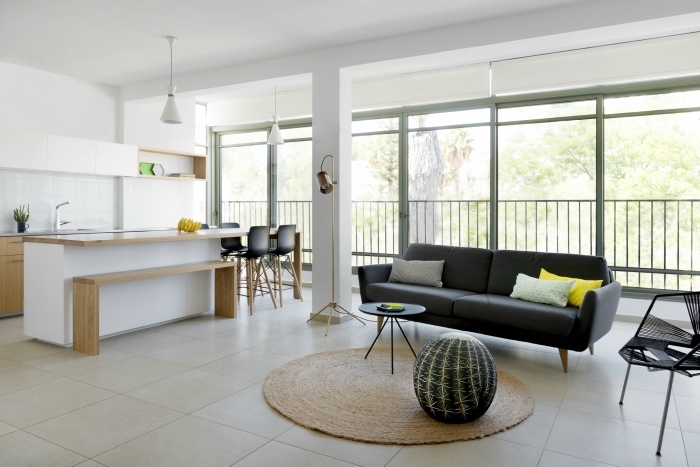 Hagat apartment designed by architect Itai Palti is that kind of home. 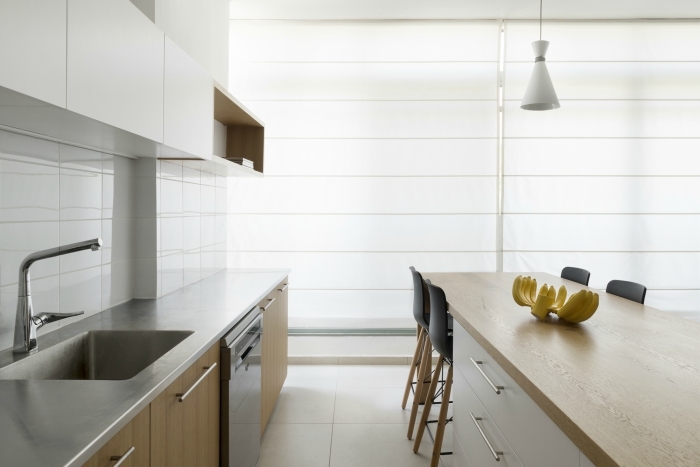 The apartment which is located in Ramat Gan was renovated for a young couple who wanted to maximise its space with as few divisions as possible. With the aim of creating an open and social home suited for family life. 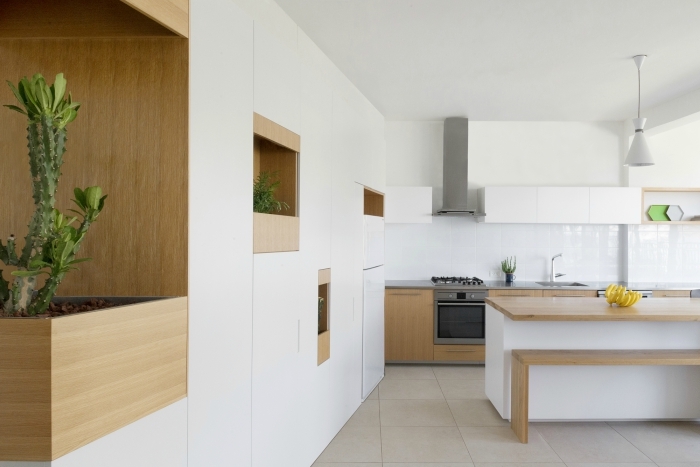 While at the same time, they wanted to maintain plenty of storage to keep the apartment uncluttered. The end result has achieved all this and much more. 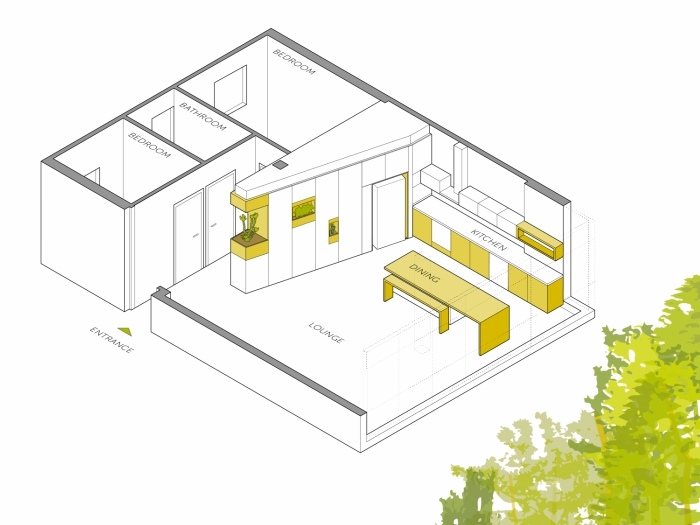 It seamlessly combines biophilic design with warm minimalism and smart storage solutions. 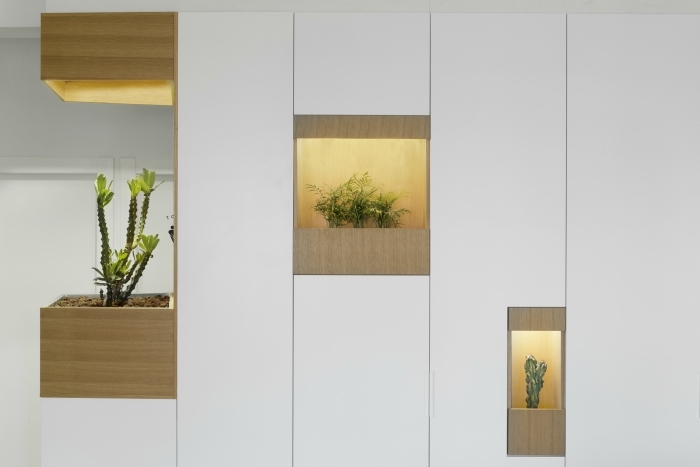 Elements from nature help bring the outside in, and smart integrated storage keeps the apartment looking streamlined. So although only 70 sqm in size, it feels far bigger. 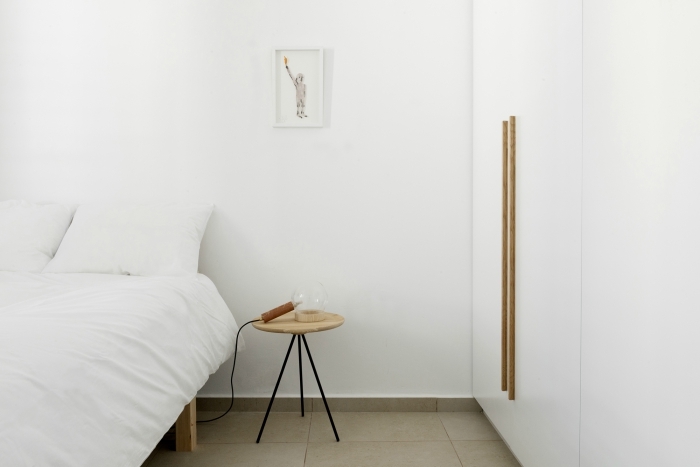 The defining component of the apartment is the multi-functional dividing wall that runs down its centre. In the kitchen and living room area it provides housing for the refrigerator and a large run of concealed storage. Oak panelled alcoves filled with plants break up the white expanse and turn it into a feature wall. 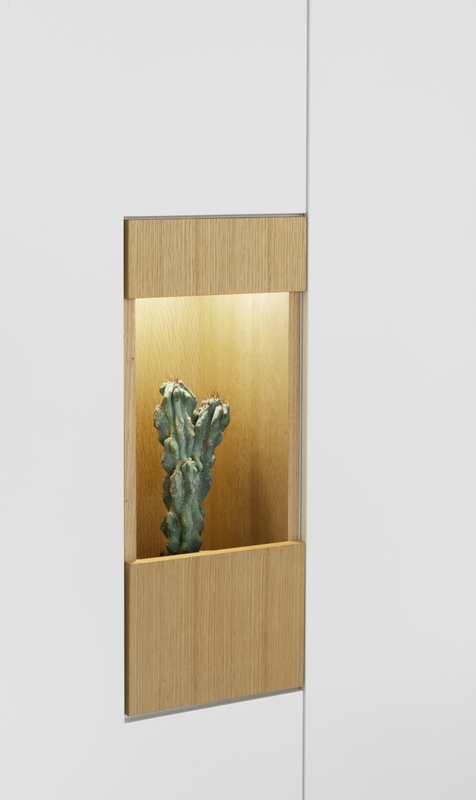 This is further enhanced by built-in lighting above each one which highlights the cacti and palms, while simultaneously providing them with essential light to help them flourish. On other side, it serves as the wall of the master bedroom with built-in wardrobes along its length. The dividing wall then extends out into the apartment to face the entrance. 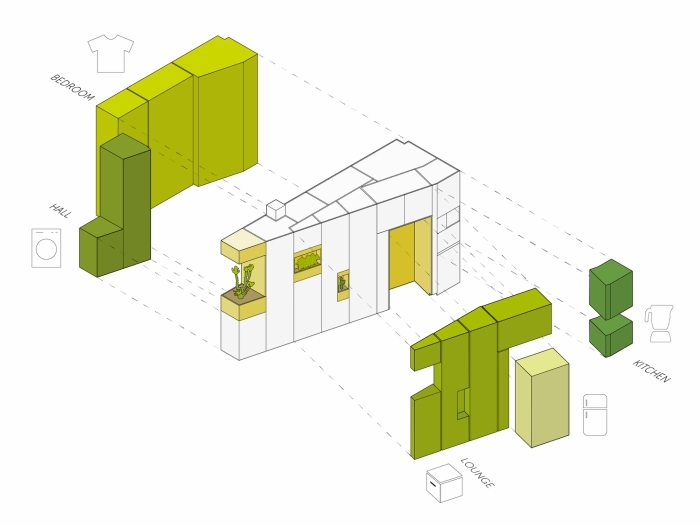 Open on three sides, it becomes a green focal point visible from all rooms in the home. And when you open the front door, the first thing to greet you will be the tranquil sight of a a verdant cactus and warm oak wood surround. Biophilic design done to perfection. A decorating scheme of minimalist white walls and units contrasts with oak furniture and grey-black seating to give the interior a modern Scandinavian look. 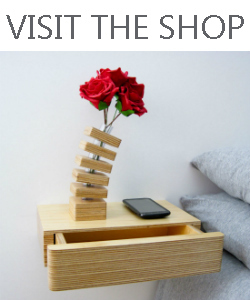 While pops of yellow and green by way of home decor accessories add some colour and interest. 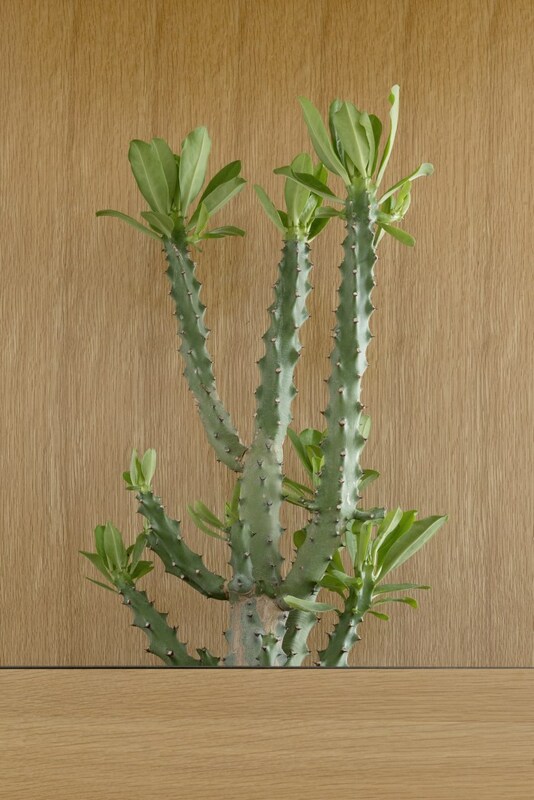 And the cactus pouffe is a subtle nod to the plants and adds a witty touch. The cohesive use of colours and materials used by the architect throughout the apartment creates a flow that helps make it feel more spacious. This is further enhanced by the floor to ceiling windows along the whole length of the living room and kitchen area. It makes it feel light and airy and fuses a connection between the interior and nature outside. 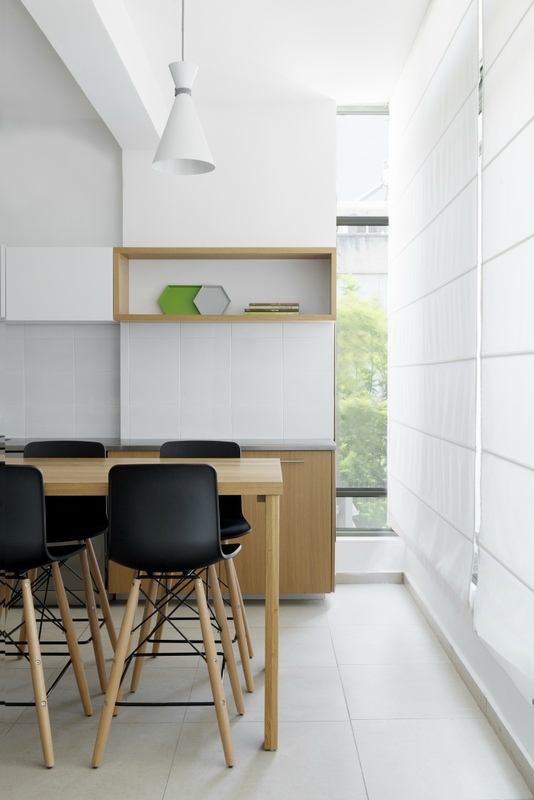 For privacy, or when the sunshine is too bright, sheer white blinds can be dropped down to shade the windows and diffuse the light. And that describes the design of this apartment perfectly.